Not much use doing some "twirling "if you do not have your own twirly skirt! 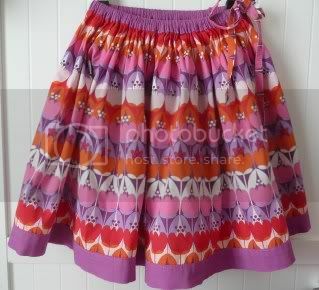 I found the tutorial for this sweet and easy little twirly skirt over at House on Hill Road. I have little experience sewing clothes but even lil'old me managed this one. I loved the hem finish ...very neat .and ..um..I am a tad lazy , so the fact that I did not even need to remove the selvedge was even better! Emily's favourite colour is purple hence her choice of fabric. And did she like the final result ? Well, after having to pry it off her to get her PJ's on last night, I think it was a winner! what a gorgeous twirly skirt. Guess what - you won my giveaway - congrats! Hi Peta! Seems you are the lucky one this week as you have won mine as well. When you get a chance would you mind sending me your postal details and I will pop it in the mail for you.